Northamptonshire is the latest council to adopt FixMyStreet Pro as their official street reporting system. 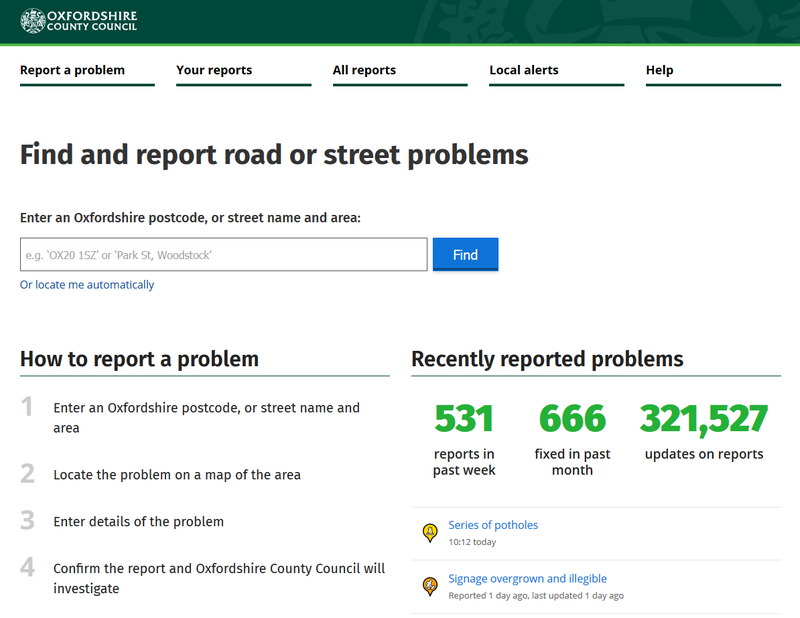 If you come across something amiss on the streets of Corby, Kettering, Daventry or anywhere else in the county, you can file a report on the council website — or do it on the nationwide site FixMyStreet.com and it’ll be routed to the council too. 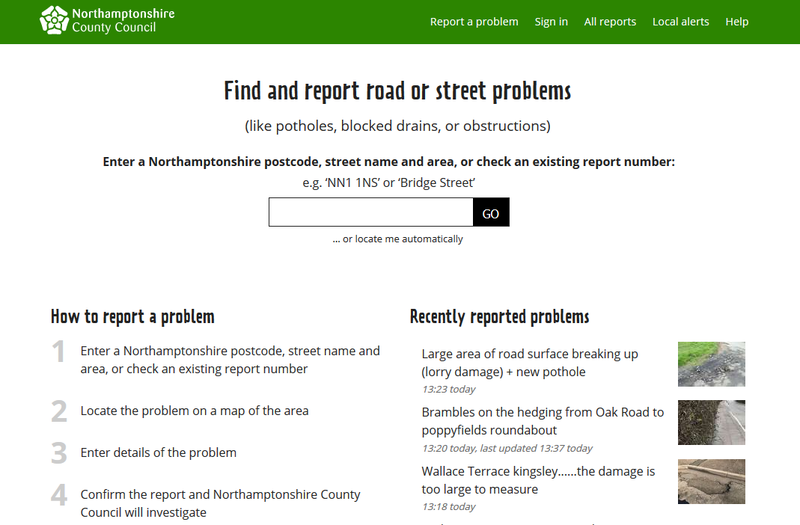 It’s been something of a full circle for Northants: in recent years, the authority had returned any reports sent through FixMyStreet, asking residents to submit via their own interface instead. The aim was to avoid ‘rekeying’ the details from emails into their inhouse system, a time-intensive task for staff — so we’re especially glad to be able to integrate FixMyStreet and drop reports directly into their backend. So, what brought about this change of direction? Timing, and our reputation, it would seem. Northants had been using their own frontend system named Street Doctor, coupled with the Exor asset management system behind the scenes — but when the contract with Exor was up for renewal, they decided it was time for a change, giving them a hard deadline by which a solution needed to be put in place. The council chose Yotta Alloy as their new asset management system, but that decision in turn meant that the council’s contractors, Kier, had to find a new frontend, since Yotta’s newer technology couldn’t align with Street Doctor’s older systems. Northants considered building their own interface, but we’re glad to say that Kier recommended purchasing FixMyStreet rather than reinventing the wheel. While the opportunity and budget were both there for the council to create something bespoke, it was recognised that by purchasing FixMyStreet off the shelf, they pass any risk on to us — and we’re happy to shoulder it. It’s great to have the confidence of a contractor like Kier, as it shows that FixMyStreet Pro is appreciated and trusted right across the sector. Kier themselves won’t need to integrate with FixMyStreet, however: Yotta Alloy will act as the middleman, from which Kier will pick up reports. The information provided by the user will ensure they go to the right team. As Kier inspectors and maintenance workers update the status of reports on their system, updates will flow into Yotta Alloy. That information will then automatically be pushed back to FixMyStreet and to the original report maker. And should a council inspector create a new report in Yotta, this too will be displayed on FixMyStreet, helping to prevent the duplicate reporting of issues that are already in hand. Meanwhile, the council’s own customer service staff will be inputting any reports they receive by phone, email or in person, directly to FixMyStreet Pro. Whatever the channel used, reports will flow seamlessly into the right places. So Northants have ended up with a neat solution, involving three different suppliers all working in harmony. The net result, we believe, will be a quicker, more integrated and more effective service for the citizens of Northants. 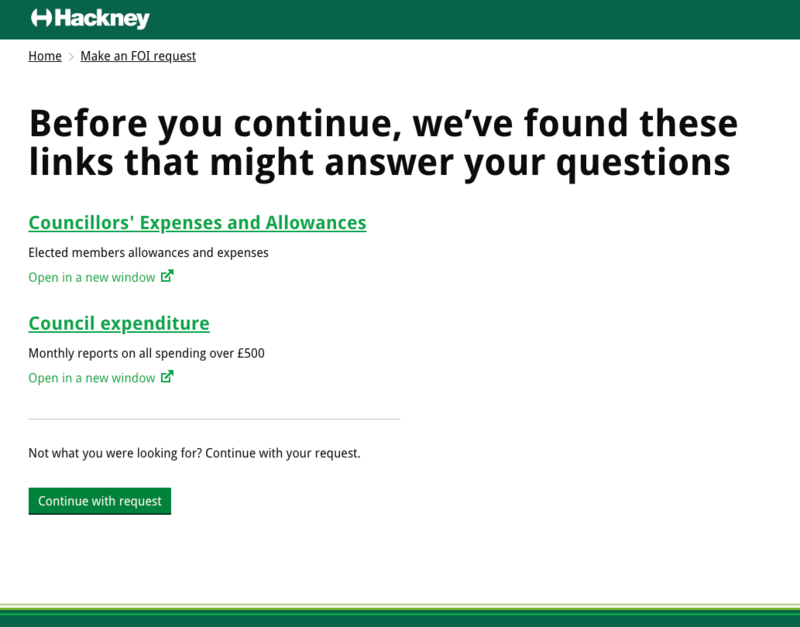 Over the last few months, we’ve been working with Hackney Council to design and make a Freedom of Information management system, imaginatively named FOI For Councils — and last time we left you with our pre-development thoughts. Well, now it’s up and running. second, to reduce the quantity of FOI requests submitted, relieving some pressure on the Information Officers at the receiving end. The solution we came up with achieves both those aims, and there’s one feature in particular that we’re super-excited about. One of the development decisions taken early on was for the system to be a very lightweight layer, largely powered by the new Infreemation case management system that Hackney were in the process of commissioning. Infreemation is targeted primarily at Information Officers, so there was no use in reinventing the wheel and building a heavy backend for our own FOI for Councils software. Instead we built the FOI request process, using our experience in designing for citizens, and submitted the data directly to Infreemation using their API. This means that every request goes straight in to the case management system used by Information Officers, with no need for double entry; a set-up we’re very familiar with from our work integrating council systems with FixMyStreet. Information Officers respond to the FOI request through Infreemation, and when they publish the response to Infreemation’s disclosure log, FOI for Councils can pull that response into its innovative suggestions engine, which we’ll discuss shortly. All this means that Information Officers get to use the tools that are designed directly with them in mind, but citizens get the best experience possible for the process at hand, rather than trying to battle the typical generic forms offered by one-size-fits-all solutions. On the user side of things we managed to reduce the process to a maximum of 6 screens for the entire process. Throughout the whole user journey we ask for only three details: name; email address and then the actual request for information. 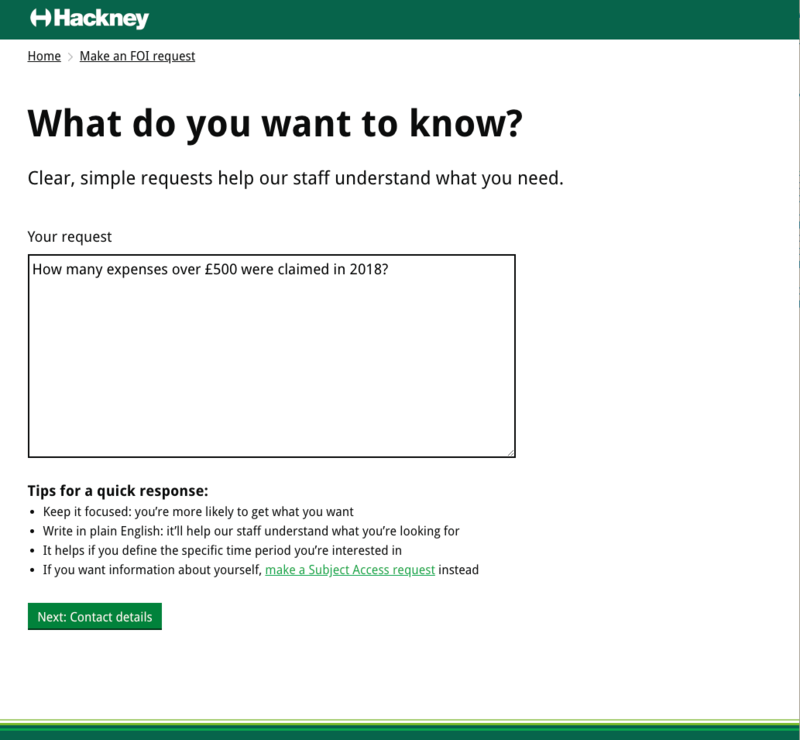 Each screen provides contextual help along the way, maximising the chances that the FOI request will be well-formed by the time it gets submitted. Making the process intuitive for the people using it is a key factor in building citizens’ trust in an authority. Too often we see complex forms with terrible usability that almost seem designed to put people off exercising their rights. So far, so good. But for us, the most interesting piece of the process is the suggestions step. Before the citizen submits their request to the authority, we scan the text for keywords to see if anything matches the pool of already-published information. If we find any matches, we show the top three to the citizen to hopefully answer their question before they submit it to the authority. This helps the citizen avoid a 20-day wait for information that they might be able to access immediately. If the suggestions don’t answer their question, the citizen can easily continue with their request. Suggestions also benefit the authority, by reducing workload when requests can be answered by existing public information. We’ve tried to make this suggestions step as unobtrusive as possible, while still adding value for the citizen and the authority. The curated links can be added to the suggestions pool by Information Officers where they spot patterns in the information most commonly requested, or perhaps in response to current events. The intelligent part of the system though, is the automated suggestions. 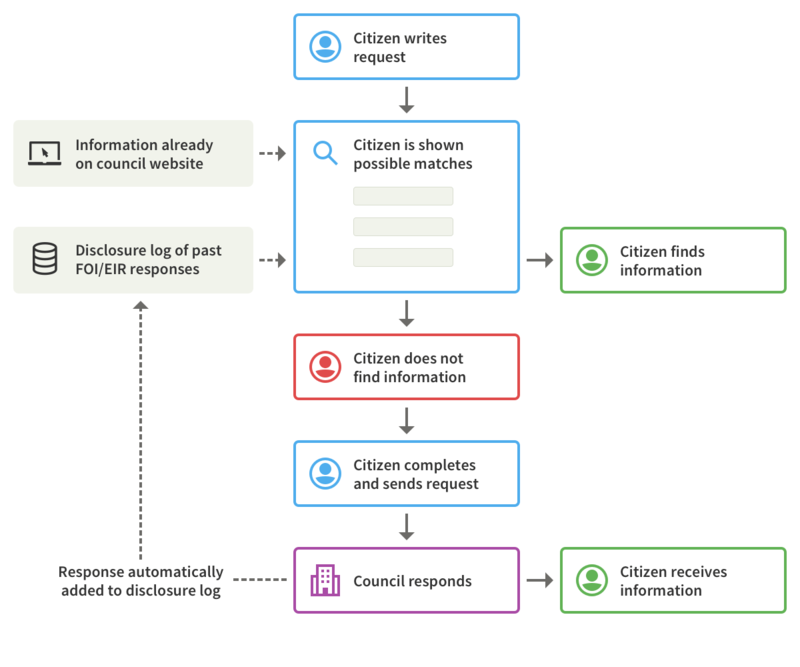 As FOI for Councils integrates with the Infreemation case management system, we can feed the suggestion pool with the anonymised responses to previous requests where the authority has published them to the disclosure log. By doing this the authority is making each FOI response work a little harder for them. Over time this automatic suggestion pool should help to reduce duplicate FOI requests. FOI for Councils also analyses the number of times each suggestion is shown, clicked, and even whether the suggestion has prevented any additional FOI requests being made. This allows Information Officers to see which information is being asked for, but where existing resources aren’t providing the information necessary to the citizen. We’ll be keeping a keen eye on how this works out for Hackney, and we’ll be sure to report back with any insights. As you’ll know if you read our first blog post from this project, we did originally envision a platform that would process Subject Access Requests as well as FOI. In the end this proved beyond the resources we had available for this phase of work. For us, this has been a really instructive piece of work in showing how authorities can commission process-specific services that connect together to give everyone a better user experience. As with most mySociety projects, FOI for Councils is open source which improves its transparency, flexibility and accountability. If you’re responsible for managing FOI requests or data protection in your own public sector body and you’d like to talk about project in more detail, please get in touch at hello@mysociety.org. 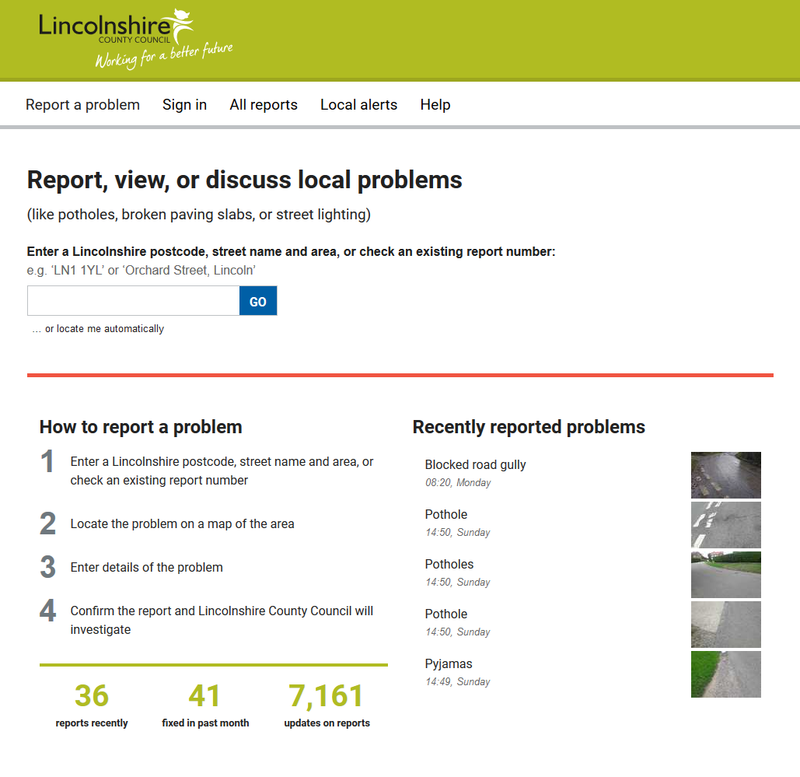 Lincolnshire County Council is the latest authority to adopt FixMyStreet Pro as their official reporting system — and we’ve never even met them. We’ve installed FixMyStreet for many councils up and down the UK, and until now, traveling to the council’s offices has always been an expected part of the procedure. But for Lincs, the entire project was managed virtually — and it all went without a hitch. The whole implementation process, from start to finish, has been incredibly smooth. Lincolnshire found out about FixMyStreet Pro via G-Cloud, and emailed us to arrange a chat. A couple of months later, with the help of email, Skype and Basecamp, their FixMyStreet instance was ready to roll out! mySociety are, of course, well used to working remotely, since that’s how our entire organisation is set up, but it’s good to see that we can bring our experience in this area to cut down travel costs, maximise the time available, and get installations rolling, all without feeling that we’ve missed out on the personal touches. After all, thanks to online video calling, you can be in those council offices to all intents and purposes, sharing your screen, answering questions and getting to know one another. The only thing we missed out on was a chance to check out Lincoln Cathedral! Just as with Buckinghamshire Council, featured on this blog last week, Lincolnshire’s FixMyStreet will also display scheduled roadworks. That ensures that no-one’s time is wasted with reports of issues that are already on the fix list. And there’s some more integration going on behind the scenes, with FixMyStreet working in harmony with Lincolnshire’s existing infrastructure management system, Confirm. Speaking practically, that means that FixMyStreet reports drop directly into the workflows the council staff are already familiar with. It’s a time-saver and a money-saver too — and it also ensures that residents can easily be kept up to date about the progress of their reports as they go through the resolution cycle. If you’d like to understand more about this, our developer Struan recently wrote a good, simple blog post on the whole topic. I approached mySociety in early May to replace our existing online fault reporting system which was to be switched off at the end of that month, and since we’ve engaged them, they have bent over backwards to help get the new fault reporting portal ready. So much so that in a matter of a few weeks we had a test site up and running and integrated with our central asset management system, and several weeks later we now have a live fault reporting system that can be accessed from anywhere on any device, that is fully integrated into our central asset management system, that displays local data for users to report against. The platform makes it easier for our citizens to report faults to us and receive updates and alerts, and provides us with more accurate information to work with. So, in short, there are wins all round: a nice easy-to-use interface for residents; time and cost savings for the council; and there’s even a nice benefit for us here at mySociety as well. Confirm is a very popular system amongst UK councils up and down the land, so this was a great opportunity to showcase just how well it can work in tandem with FixMyStreet Pro. mySociety have been fantastic. I cannot praise them enough; it has been a delight to work with them. They have been very responsive and fully supportive throughout the whole implementation process. If you’re a council which uses Confirm — or if you’d like to find out how we could integrate with another asset management system — check out the FixMyStreet Pro website, and then get in touch. Our most recent improvement to FixMyStreet means that users in Bromley will experience some clever routing on their reports. It’s something quite a few FixMyStreet users have requested, telling us that they’d reported a street issue in London, only to have a response from their authority to say that it was located on a ‘red route‘ — roads which are the responsibility of TfL rather than the council. Of course, most councils have systems set up so that they can easily forward these misdirected reports to the right place, but all the same, it wasn’t ideal, and added another step into a reporting process we’ve always tried to keep as simple and quick as possible. Thanks to some development for Bromley council, we’re now glad to say that within that borough, reports on red routes will automatically be forwarded to TfL, while other reports will be sent, as usual, to the relevant council department. As a user, you don’t have to do a thing (although you can see this automated wizardry in action by watching changes in the text telling you where the report will be sent, as you click on the map in different places and select a different category – give it a go!). Note that this functionality has not yet been extended to the FixMyStreet app; however in the meantime it will work if you visit fixmystreet.com via your mobile browser. As you’ll know if you’re a frequent FixMyStreet user, the site has always directed reports to the right UK council, based on the boundaries within which the pin is placed. And equally, even within the same area it can discern that different categories of report (say, streetlights as opposed to parking) should be sent to whichever authority is responsible for them: that’s an essential in a country like the UK with its system of two-tier councils. So this new innovation just meant adding in a map layer which gives the boundaries of the relevant roads that are designated red routes, then putting in extra code that saw anything within the roads’ boundaries as a new area, and TfL as the authority associated with road maintenance categories within that area. FixMyStreet has always been flexible in this regard: you can swap map layers in or out as needed, leading to all sorts of possibilities. 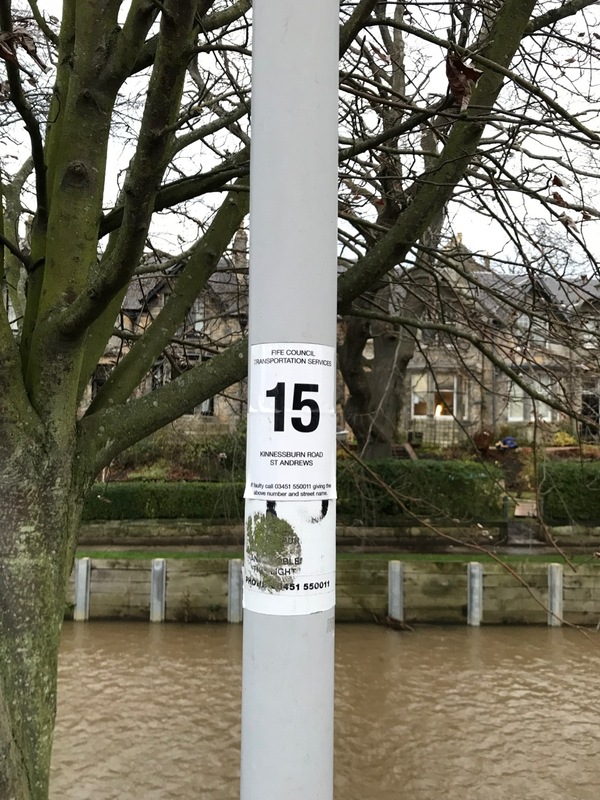 Yesterday, we showed how this approach has also averted one common time-waster for councils, and the same set-up is behind the display of council assets such as trees and streetlights that you’ll see for some areas on FixMyStreet. The integration of red routes is available for any London Borough, so if you’re from a council that would like to add it in, get in touch. And to see all the new innovations we’re working on to make FixMyStreet Pro the most useful street reporting system it can be, check out the website. 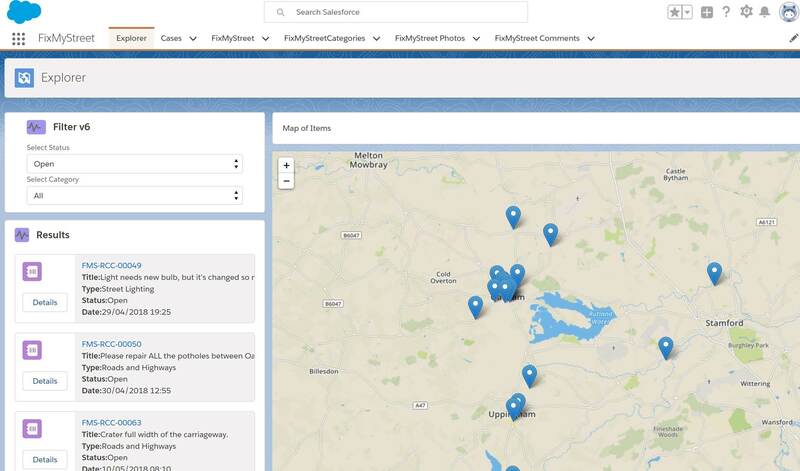 A big welcome to Rutland, the latest local authority to adopt FixMyStreet Pro as their street fault reporting platform. If you’re a resident of what has been described as the UK’s prettiest county, we hope that you’ll enjoy using FixMyStreet to keep it that way. You can make your reports on the council’s site here, or if you’re already used to the main FixMyStreet. com website or via our mobile app, you’ll find that all reports go into the same central database, and can be seen in all three places. As a resident, all you need to know is that it all works, but councils — especially those using the Salesforce CRM — will be interested to know that behind the scenes there have been some interesting tweaks. Salesforce is a very common CRM, in use across many councils as well as countless other businesses and organisations, so this integration stands as a useful proof of concept when it comes to FixMyStreet integration. 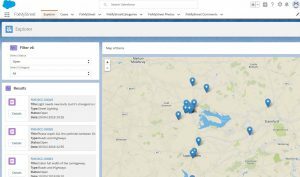 For Rutland, FixMyStreet reports now drop directly into Salesforce, from where they can be allocated to the Highways team. Click on any of the images below to see them at a larger size. Here’s what the list of all reports looks like in Salesforce. In theory, if the council want, this could also include reports from other sources such as residents’ phone calls or direct emails. Staff may filter the reports by category: here we can see just those within the ‘roads and highways’ category. Each report is listed within Salesforce as a ‘case’, listed in a queue. And this is what it looks like when a report comes in that has a photo attached to it — that’s also accessible within Salesforce. Staff now have the choice of updating reports within Salesforce, or, if they prefer (as many do), through the FixMyStreet admin interface. Even better, any reports made through other means can be pulled from Salesforce and into the FixMyStreet system: so a council staff member inputting reports from, say, an email report or phone call can input it into the interface they’ve always used. We’re delighted to add Salesforce to the list of CRMs FixMyStreet Pro has integrated with. If you’re from a council and would like to find out more, pop over to the FixMyStreet Pro website where you’ll find case studies, pricing, an interactive demo and the chance to join one of our regular online chats. We often talk about how FixMyStreet Pro can integrate directly with council’s existing systems, and how doing so can help councils be more efficient — but what exactly does that mean in practice? Let’s take a look at our two most recent FixMyStreet Pro installations. Both B&NES and Buckinghamshire councils use the same asset management system, Confirm, and it gives us a great example of how FixMyStreet Pro’s ability to ‘communicate’ with such systems will make everything a whole lot easier for residents and for council staff, even with two very different types of local authority. FixMyStreet has always provided the resident with an easy interface through which to file a street report. For many councils, however, such reports arrive in an email inbox and then have to be forwarded to the right location or typed into the council’s CRM, all adding to the sum total of time and effort dedicated to each report. Now, using the Confirm API, Bucks and B&NES councils can access and work on FixMyStreet reports through Confirm’s standard ‘inspector module’, removing any need for this extra step. Optionally, the information flow can go both ways, and indeed this is the case for both B&NES and Buckinghamshire councils. What this means is that for example, when an issue has been inspected and council staff change its status (perhaps from ‘report received’ to ‘repair underway’), this status change will be passed back to FixMyStreet, automatically syncing with the site, and notifying the report-maker with the update — again removing another mundane task from customer services staff. If a highways inspector should come across a new issue while they are out and about on their rounds, they can raise an issue in Confirm just as they always would have. But now, that will also create a report on FixMyStreet which residents can view, keeping everyone up to date and ensuring that reports aren’t made about issues that the council already know about. FixMyStreet Pro also allows for council administrators to create template responses — an invaluable timesaver when responding to one of the more common situations such as “issue identified and prioritised” or “issue now fixed and closed”. While Confirm also has its own template responses, FixMyStreet Pro offers more flexibility, as the same template can be reused across multiple report categories and status types. Buckinghamshire really saw the benefit of this: they were able to reduce the number of templates in use from around 450 to 46. Assets such as streetlights, grit bins and gullies can be pulled through from Confirm and overlaid on the map. This makes it significantly easier for both residents and staff to locate and report issue, speeding up the issue resolution time — we’ll be delving more deeply into this in our next blog post, with a few more technical details for those who are interested.